One of the most famous places in the world Venice has for centuries attracted people to its shores. It is famed for being the city of romance, built on the sea and criss-crossed by canals. Its buildings and monuments are renowned world-wide and the image of a Venetian rowing a gondola is most couples’s ideal romantic break. I have always had a great desire to go to Venice. I imagined it to be home to pristine water-ways and canals. I imagined a city full of character and sentiment, full of culture and full of life. And last April I was able to discover it, thanks to the best birthday present ever! Venice does truly have the signs of having been a majestic place, a capital of culture as well as of commerce. 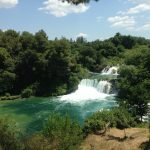 A vibrant place to visit or even to live. 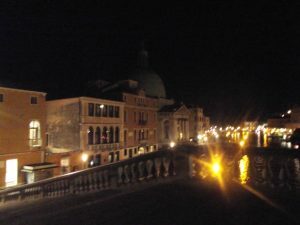 We first arrived in Venice at night via the tram that crosses from the mainland into the heart of the lagoon. Straight away you get a sense of having arrived at a place totally apart from all that surrounds it. Not just because it is physically ‘completely’ separated from mainland Italy and you have to reach it by crossing over to the lagoon via a long road/tram line over the ocean, but because it is unlike anywhere I have ever been before. Arriving at night you do get a sense of being in an exciting new place. The half dark ‘island’ gives glimpses of colour from buildings that straight away pass a sense of abandonment. In the narrow streets you come across busy bodies strolling up and down. Many excited other visitors happily getting lost in the narrow alley-ways, ending up at the end of routes with no way out and having to go back – still excited because this is what experiencing Venice is all about. Despite the dark and despite being in a completely new place for the first time, you don’t get the sense of anxiety or apprehension that you would get from being anywhere else that late at night. In Venice we felt a sense of being somewhere utopic. You don’t see any policemen in the streets (alleys) but you do not see any crimes either. You don’t fear the dark alleyways and you don’t fear the strangers. After all, everyone there seems to be ‘strangers’, not locals, not Venetians, just strangers. Just tourists in discovery of a great beautiful and majestic City on a lagoon. 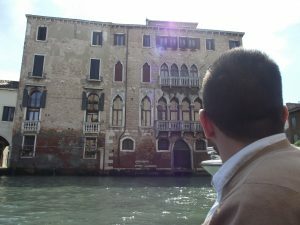 On our first morning in Venice we were mesmerised still by the idea that we were actually there. We now had the light of day which allowed us to have a clearer picture of this place. We could now see the real Venice of today in daylight. We saw many brightly coloured houses that have seen past glories and past riches. ‘Palazzos’ falling apart, un-cared for and empty. Restored façades standing tall outlining the beautiful city of Venice. It is almost as if all the façades made up a shell for an empty body. All the houses and the Pallazos seemed to be lifeless, apart from those that were now shops or galleries. During the next couple of days crowds of tourists arrived and left. At any given time of the day you would see someone carrying luggage into or out of Venice. All of us attracted to this iconic place for its its uniqueness, its beauty and its grandeur. It felt almost like a giant holiday resort where the attraction is the city itself. The waterways, the alleyways, the churches, the museums, the gondolas, the vaporetto – the whole of Venice is an experience in itself. You come to Venice to ‘experience’ Venice. Its grandeur is still very much fascinating. The breathtaking panoramic view of the Pallazzo Ducale from the approaching ‘vaporetto’ is an experience in itself. 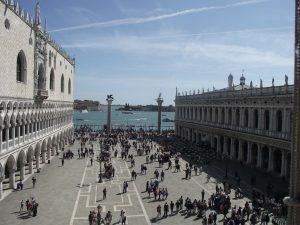 Standing in the Piazza San Marco feels as if you were looking back into time and getting a glimpse of grander eras. Inside the Basilica from the top floor you glare at the round cupola ceiling and the striking decoration all round you. 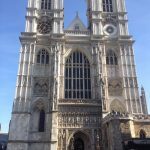 (Amazingly it feels a little less magnificent when you later learn that most of the riches that adorn such an imposing monument was in fact stolen from across the world).